For many Americans, Thanksgiving is a time of celebration, family gatherings, and big traditional dinners. However, for many Native Americans there simply isn’t much to celebrate. Isolated on remote reservations, plagued by overwhelming poverty and hopelessness, Native Americans face high disease rates and food insecurity. Among those most tragically affected are the Elderly. Talia One Horn’s beautiful smile expresses the delight felt by those who attended a SNRF Thanksgiving feast. 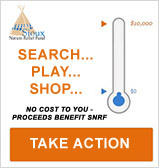 The Sioux Nation Relief Fund (SNRF) is determined give the people on the Pine Ridge Reservation an opportunity for enrichment on Thanksgiving Day. Together, we’ll forge new memories and make this day a time of camaraderie for people who often spend the rest of the year living alone or struggling with impoverishment. 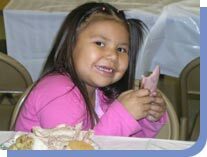 SNRF Thanksgiving serves Sioux Indian people from communities on the Pine Ridge Reservation, along with Sioux communities on several other reservations in South Dakota. Volunteers prepare dishes like turkey, corn, mashed potatoes, and pie for the Elders and their families to enjoy. the Little Wound Kyle Community. 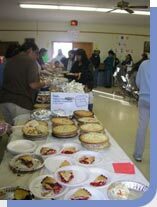 The Sioux Nation Relief Fund provides the delicious food for this special occasion. However, SNRF thanks all of the community volunteers who came together to plan, prepare, and serve these Thanksgiving meals. They fill everyone at the table, not only with good food, but also with genuine thanks and memories.